Looking forward to starting your own website but can’t decide which web host to go with? You’re not alone! Nowadays, a lot of web hosts have popped up in the market, promising you with the “best hosting solutions money can buy”. But be warned – some of these companies will just rip you off and provide you with sub-par hosting services! What’s more, there are literally hundreds of thousands of web hosting companies out there, which makes the hunt for a good hosting provider even more challenging. No matter how hard you try to avoid it, you’re going to need a web host if you want to establish an online presence. Some individuals and businesses maintain their own web server, but maintenance alone can be quite costly and time-consuming. This is why most of us invest in the services of a web hosting company instead. WestHost isn’t exactly a household name in the web hosting service, and it’s not the cheapest either. But having been in business since 1998, you just have to wonder what they’re doing right to have stayed this long in such a fierce and ever-changing market. The company seems to have adjusted well to the battles in this industry, and is home to hundreds of thousands of websites owned by various individuals and businesses across the globe. But how do they fare against their competitors and what are the pros and cons of purchasing a hosting package with them? Are the higher priced hosting plans worth it? Let’s find out the answers in this WestHost in-depth review. WestHost Web Hosting – What’s Their Story? WestHost was established in 1998 and is headquartered in Providence, Utah. 10 years after, the company was acquired by one of the largest global web hosting provider, UK2 Group, in its effort to further expand its already powerful global presence. Under the UK2 Group, WestHost is able to provide their clients with an exceptional web hosting experience. Their singular focus is to provide a powerful and secure web hosting environment, at a reasonable cost. This company is one of the first to provide web hosting for clients all over the world, maintaining a solid reputation by providing the best and latest technology, with top-notch customer support. Today, they also provide domain registrations and hosting; on top of various hosting options including shared hosting, VPS cloud hosting, dedicated servers, etc. WestHost have over a million client websites under their wings. The company claims that 50% of their employees are multi-lingual, with a good number having more than 5 years of experience in the IT industry. WestHost have a diverse range of web hosting options for their large client base. They’ve tailored their services around the needs of their clients, providing flexible and scalable hosting solutions. Their hosting options include shared web hosting, VPS cloud hosting, and dedicated servers, just to name a few. WestHost offers shared web hosting, which is the perfect solution for those who are new to building a website or just need to build a small and simple site. And by this, I mean a site that doesn’t need hundreds of web pages and is not expecting hundreds of thousands of site visitors. They offer three different plans: Personal, Preferred, and Business. 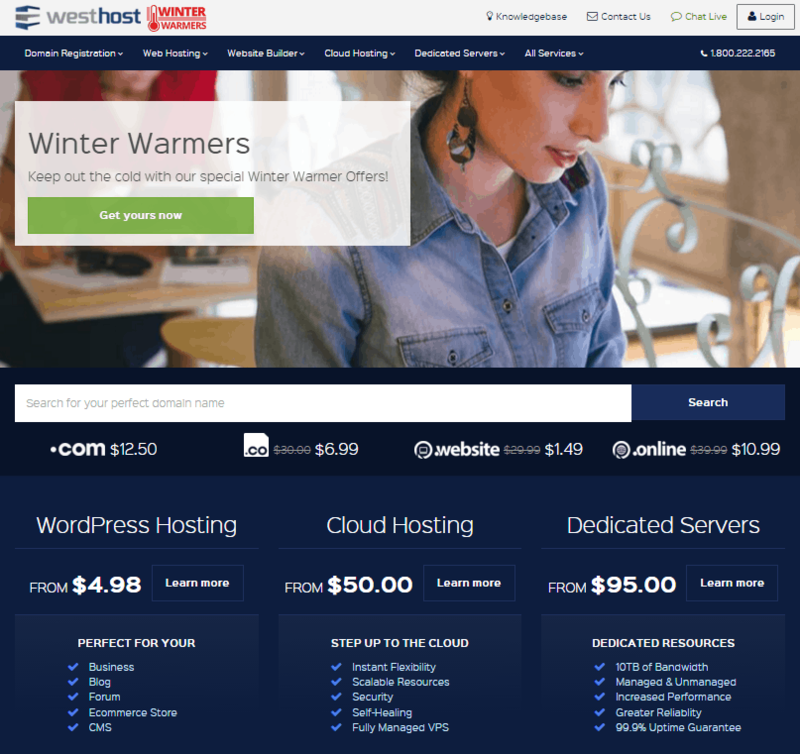 If you sign up today, you can even take advantage of WestHost’s special promo called “Winter Warmers”, where you can get a limited-time discount up to 50% on all of their shared hosting plans. You better hurry, though, because the Winter Warmers promo is about to end soon! Just imagine the money you can save with this amazing promo! The first tier, the Personal plan, comes with just the right features and tools to get you started with your site. It comes in at a price starting from $2 per month, which already includes 50 GB disk space, 1000 GB bandwidth, and 1 database. That’s a whole lot of data that you can use at such a low price! For those who need more out of their hosting package, you might want to go for the Preferred plan, which comes at $4 a month. It builds upon the Personal plan, although it comes with 200 GB disk space, 2500 GB bandwidth, unlimited databases, as well as a free domain. From $6 a month, the final tier – the Business plan – is largely unlimited (disk space, bandwidth, databases), with a free domain and a dedicated IP address. This is the perfect plan for those who want to start building a small eCommerce website. Also, take note that all three shared hosting plans come with FREE setup, which is a big plus for me. Depending on the type of site you wish to build, these shared hosting plans can handle decent amount of traffic. Performance shouldn’t be a problem as well, unless you’re using power-hungry web applications on your site. That and a high volume of traffic, of course. Again, WestHost’s hosting plans are not the cheapest I’ve seen (especially without the Winter Warmers promo), and they’ve even placed some restrictions on the low-tier plan. It’s sparse on features, but it might just do the trick for personal users and small businesses on a budget. Still, it pales in comparison to other popular web hosting providers like BlueHost and iPage. Have you outgrown your shared hosting plan? Need more room for your ever-growing business? Perhaps it’s time to upgrade to a more powerful VPS cloud hosting plan. With WestHost’s VPS cloud hosting, you’ll get instant flexibility, security, scalability, and self-healing – all without being tied to a contract. It’s like getting the incredible power of a dedicated server, but for an exceptional value. 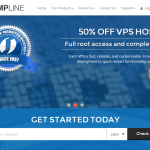 WestHost’s VPS cloud hosting is split into three packages: Burst, Storm, and Monsoon. At $50 a month, the lowest plan, Burst, provides you with 20 GB disk space and 500 GB bandwidth. The Storm plan, which is at $100, comes with 50 GB disk space and 1250 GB bandwidth. It’s just as powerful as a decent starter-level dedicated server. Meanwhile, the highest plan, the Monsoon plan, is at $150 per month. With this plan, you’ll get 90 GB disk space and 2250 GB bandwidth. All of these plans are powered by Xen and Linux virtualization technology which provide better failover and self-healing features. What’s more, each of these plans comes with 1 dedicated IP address. Unlike other VPS plans, you don’t get to choose the OS because WestHost only supports the Linux platform. However, if you need more storage, bandwidth, CPU, or RAM, you can always contact them for a hassle-free upgrade. My only concern with WestHost’s VPS cloud plans is that they’ve also placed data limits on the low-tier plan. You might not be able to consume all these data but if you’re expecting growth to your site, you’ll definitely need more. On the plus side, you can get a cPanel license for free so you don’t have to dive into command line to manage your hosting platform. 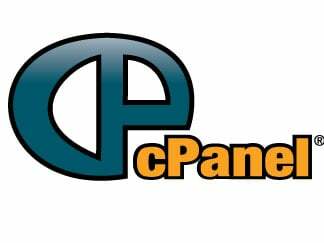 With a cPanel license, you can install and configure the latest version of cPanel. This alone is quite appealing, considering that many other web hosts will have you pay an extra $10 or more for the cPanel license alone. What’s more, they even offer free backups and SSL Certificate. Talk about great value! When shared hosting isn’t enough to give your site security and room for growth, then you probably need a dedicated server. With dedicated hosting, you don’t have to share a web server with other websites. What’s more, a dedicated server offers a higher level of security, increased reliability, with plenty of room for growth. In short, WestHost will handle the heavy lifting while you focus on growing your business. They will handle all the regular maintenance of your server while you focus on what you do best. On the other hand, if you’re an advanced user and you want to save money, you can manage your own server with WestHost’s unmanaged server hosting option. Take note that all of the services and options included in the managed dedicated server are available for purchase a la carte if you wish to choose the unmanaged dedicated server. The price difference is small enough to make the managed dedicated server a more appealing choice for anyone who’s not inclined to tinker their web server. Overall, WestHost’s offerings are competitive despite not being a household name in web hosting. WordPress has been around for over 10 years and have grown to be the largest, most powerful blogging platform in the world. It’s used by millions of site owners and web developers, and seen by tens of millions of site visitors every single day. It’s flexible, it’s search engine optimized, and you’re spoiled for choice with thousands of beautiful themes and useful plugins! Luckily, WestHost give you a choice between manually installing WordPress and opting for their Premium WordPress hosting plan. With manual install, you can simply log in to your cPanel account and select the Softaculous One-Click Installer from the Software & Services section. From there, click the Blogs link in the list on the left-hand side of the screen, and then the WordPress icon where a WordPress info screen will load. Click on the ‘Install’ button, follow the prompts, and then complete the installation process. That’s it, you’re done! If you want to give your WordPress site the home it truly deserves, consider fitting it on one of WestHost’s lightning-fast WordPress optimized servers. With Premium WordPress Hosting, you have access to over 50 free beautifully crafted themes, plus free backups and malware protection so you can make the most of your Web presence. You can choose between 2 packages: Primary and Pro. Starting from $9.99 a month, you can take advantage of their powerful WordPress hosting plans. And if you opt for the yearly package, you can reap the benefits of their limited-time Winter Warmers promo where you can get a 50% discount. That’s a load of savings, so you better hurry before the promo ends! WestHost’s WordPress hosting plans are a bit more expensive compared to the plans offered by other web hosts but if you decide to commit to a 1- or 2-year plan, then you’ll definitely get to save more money. If you think you can’t commit to a year or more, consider checking out other WordPress hosting plans offered by web hosts like BlueHost and iPage. Want to build a truly unique website that look great on every screen, including smartphones and tablets? With the Website Builder v7, you’ll have all the site-building tools and options you need to create a truly awesome website even if you don’t have technical skills or coding experience! With Website Builder, you can fully customize your site for a great look on every screen size. 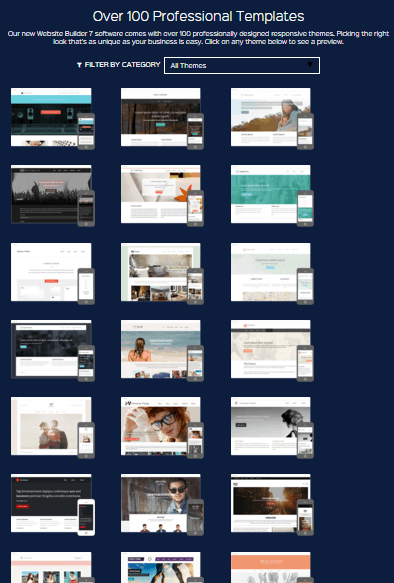 You don’t even need to install any software to give your site a unique design – with a choice of over 100 responsive professional themes complete with placeholder content and images so you can get started right away. Website Builder v7 is a great option among business owners, too, since it comes packed with eCommerce tools for online shoppers. You can choose from three different packages: Essential, Business, and Business Unlimited. Prices range from $4.95 a month to $13.95 a month. WestHost even lets you test the waters by offering a free 30-day trial so go ahead and give it a shot, and decide whether or not it’s for you. WestHost is able to deliver a simple setup and a well-polished cPanel control panel that’s a breeze to navigate and use. Many other hosting providers I’ve reviewed also use cPanel, and though their version of cPanel is feature-rich and flexible, it can sometimes be a bit overwhelming. The interface almost have a seemingly endless collection of feature icons, something new users may find difficult to navigate. With WestHost, you’ll get a straightforward and easy-to-use cPanel, with an intuitive interface that lets easily make the necessary changes on your website. It also gives you easy access to billing, support, and domain management, among many others. You can do all of these even if you have no prior experience in coding and programming. 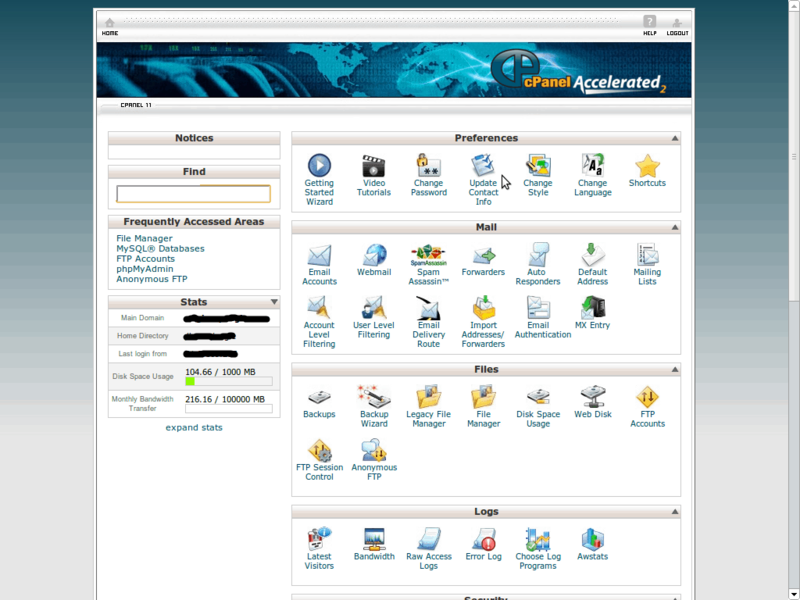 The cPanel interface in each section is collapsible, allowing you to hide unnecessary sections. This creates a clutter-free and navigable interface that shows you only the features and tools you often use. WestHost even gives you access to a reliable website builder to help you with numerous integrated features. What’s more, through the Softaculous auto-installer, you have access to over a hundred popular applications that you can install and add to your site with just a single click. WestHost offer their clients an industry-standard 99.9% uptime guarantee, with records showing that they have never been down once for over a year. Their servers are running throughout, without any interruptions. The company boats state-of-the-art equipment and uses the latest technology in their data center. On top of that, they have the best and most skilled technicians in the industry; monitoring their servers 24/7 and all set to fix technical issues to avoid interruptions to your site’s performance. A few years ago, WestHost used to offer a longer 60-day money-back guarantee. For reasons unknown, they’ve recently reduced it to a typical 30-day money-back guarantee. This is better than nothing, though, and it’s applicable to all their hosting plans. 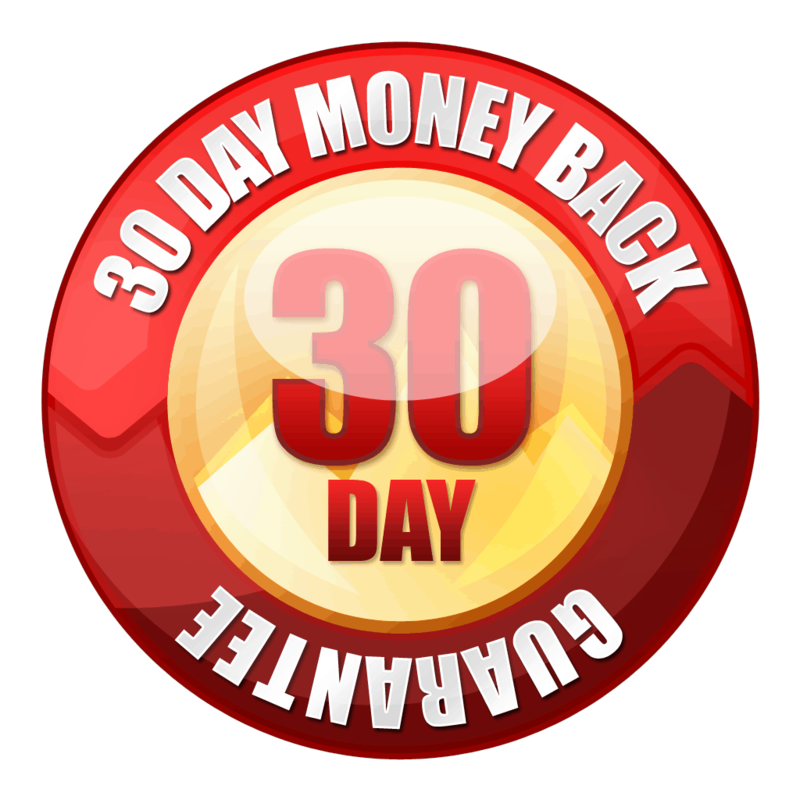 With a 30-day money-back guarantee, you can try out their service and if you’re not satisfied with what they have to offer, you can ask for a refund. Once you fill out the cancellation form within that 30-day period, you’ll have your money back – no questions asked. I haven’t found a lot of complaints about their services and there doesn’t seem to be an issue with their money-back guarantee. I take this as a good sign, since it could mean that clients are satisfied with their service and don’t need to get a refund. While WestHost’s service isn’t the easiest to use, their customer support system definitely helps bridge the gap. 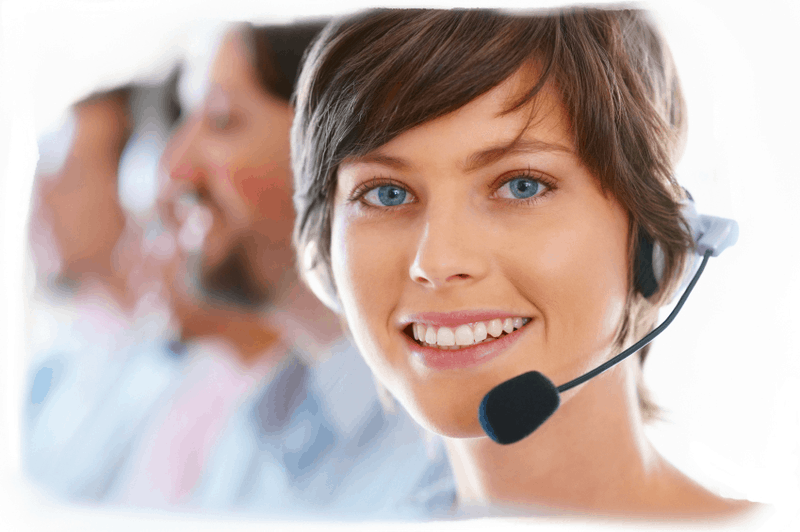 They offer plenty of methods for you to reach a customer representative, including a support ticket system, email, and the more direct methods like toll-free telephone and live chat support. The quality of support and the response times are a mixed bag. Once, I had to wait for 17 minutes before I could talk to a customer rep. Yet in another instance, I was immediately connected with a friendly and helpful staff. Response time for emails varies from 30 minutes to 24 hours. It’s a huge swing, but then, I’ve timed their response time during various times of the day, as well as on different days of the week. For me, it’s only natural that response time is slower on non-business hours and on weekends, but I don’t know how they could explain the long wait times during business hours. I couldn’t deny the fact, though, that the customer reps are knowledgeable and were able to solve my problems in a professional manner. Their staff are clearly US-based and not just outsourced from a call center agency. They are trained well to do their job and there’s no language barrier. Apart from the usual customer support methods, WestHost also have an impressive knowledgebase with some useful guides and tutorials. They also have a FAQs section, with questions organized by popular topics such as cPanel, eCommerce, general hosting, merchant accounts, etc. In fact, they have one of the most extensive FAQs section I’ve come across during my research. If you need more help, you can also visit their online forums, where you can find more useful guides and tips from fellow WestHost users. You can also share some tips and advice, if you have any. This web host does a great job in balancing good performance, competitive pricing, and reliable customer support. While they don’t boast as many hosted domains as the top names in the industry, they are home to over a million domains. Sure, they’re a bit more expensive than the competition but they position themselves as a value, rather than a bargain. They offer feature-packed hosting plans at every level, striking a perfect balance between power and affordability. Plus, I’m certain you won’t be competition with millions of other domains for customer support or server resources. WestHost strive to set themselves apart from the competition with true value and outstanding customer support. For the most part, they’ve succeeded in their mission. In terms of high-end plans, however, premium services are somewhat counteracted by a Linux-only hosting environment and the modest limits on resources like disk space, bandwidth, and RAM. Resource-hungry and/or high-traffic websites might want to take a closer look at their plans first, or compare their offers with other similar hosting providers. When you’ve been in business longer than Google or Facebook, something magical happens – a secret recipe for standout web hosting solutions. Needless to say, WestHost know what it takes to be a master in their art – to love what they do and to strive to be better at their craft than anyone else. They may not set new standards or redefine anything in today’s web hosting industry, but you’ll definitely have a pleasant hosting experience with them. So, are the higher priced hosting plans worth it? My answer would be yes – with reservation! A reliable web host with plenty to offer to new and experienced users alike. WestHost may have higher priced hosting plans compared to the competition, but with quality hosting plans and customer support, they’re definitely worth considering.